An overview of the basics of solar flares and other disturbances including CMEs and how they affect ionospheric HF radio propagation conditions for two way radio communications, maritime mobile radio communications, point to point radio communications and radio broadcasting. The condition of the Sun has a major impact on ionospheric radio propagation. Accordingly it affects a variety of forms of HF radio communications including two way radio communications, maritime mobile radio communications, general mobile radio communications using the HF bands, point to point radio communications, radio broadcasting and amateur radio communications. As the Sun provides the radiation that governs the state of the ionosphere and hence HF radio propagation, any flares or other disturbances are of great importance. Under some circumstances these can enhance radio communications and the HF radio propagation conditions. Under other circumstances they can disrupt radio communications on the HF bands, while at the same time providing some radio propagation conditions that can be used at VHF by radio amateurs. there are a number of types of disturbance that are of particular interest for radio communications. Flares are one of the most obvious. However, apart from solar flares there are other disturbances that occur. One is the coronal mass ejection, and there are also coronal holes. 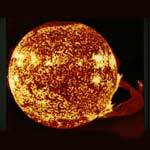 Solar flares are enormous explosions that occur on the surface of the Sun. They result in the emission of colossal mounts of energy. In addition to this, the larger solar flares also eject large amounts of material mainly in the form of protons. Flares erupt in just a few minutes with apparently no warning. When they occur the material is heated to millions of degrees Celsius and it leaves the surface of the Sun in a huge arch, returning some time later. The flares normally occur near sunspots, often along the dividing line between them where there are oppositely directed magnetic forces. It is the magnetic fields appear to be responsible for the solar flares. When the magnetic field between the sunspots becomes twisted and sheared the magnetic field lines may cross and reconnect with enormous explosive energy. When this occurs an eruption of gases takes place through the solar surface, and it extends several tens of thousands of miles out from the surface of the Sun and follow the magnetic lines of force to form a solar flare. The gases from within the sun start to rise and the area becomes heated even more and this causes the level of visible radiation and other forms of radiation to increase. During the first stages of the solar flare, high velocity protons are ejected. These travel at around a third the speed of light. Then, about five minutes into the solar flare, lower energy particles follow. This material follows the arc of the magnetic lines of force and returns to the Sun, although some material is ejected into outer space especially during the larger flares. Effect of solar flares: For most solar flares, the main effect felt on Earth is an increase in the level of solar radiation. This radiation covers the whole electromagnetic spectrum and elements such as the ultra-violet, X-rays and the like will affect the levels of ionisation in the ionosphere and hence it has an effect on radio communications via the ionosphere. Often an enhancement in ionospheric HF propagation is noticed as the higher layers of the ionosphere have increased levels of iononisation. However if the levels of ionisation in the lower elvels start to rise then this can result in higher levels of attenuation of the radio communications signals and poor conditions may be experienced. Additionally an increase in the level of background noise at VHF can also be detected easily. Flares generally only last for about an hour, after which the surface of the Sun returns to normal although some Post Flare Loops remain for some time afterwards. The flares affect radio propagation and radio communications on Earth and the effects may be noticed for some time afterwards. Solar Flare Classifications: Flares are classified by their intensity at X-ray wavelengths, i.e. wavelengths between 1 - 8 Angstroms. The X-Ray intensity from the Sun is continually monitored by the National Oceanic and Atmospheric Administration (NOAA) using detectors on some of its satellites. Using this data it is possible to classify the flares. The largest flares are termed X-Class flares. M-Class flares are smaller, having a tenth the X-Ray intensity of the X-Class ones. C-Class flares then have a tenth the intensity of the M-Class ones. It is found that the occurrence of these flares correlate well with the sunspot cycle, increasing in number towards the peak of the sunspot cycle. Coronal mass ejections, CMEs, are another form of disturbance that can affect radio communications. Although much greater than flares in many respects, CMEs were not discovered until spacecraft could observe the Sun from space. The reason for this is that Coronal Mass Ejections, CMEs can only be viewed by looking at the corona of the Sun, and until the space age this could only be achieved during an eclipse. As eclipses occur very infrequently and only last for a few minutes. Using a space craft the corona could be seen when viewing through a coronagraph, a specialised telescope with what is termed an occulting disk enabling it to cut out the main area of the Sun and only view the corona. This enabled the corona to be viewed. Although ground based coronagraphs are available, they are only able to view the very bright innermost area of the corona. Space based ones are able to gain a very much better view of the corona extending out to very large distances from the Sun and in this way see far more of the activity in this region, and hence view CMEs. Coronal Mass Ejections, CMEs are huge bubbles of gas that are threaded with magnetic field lines, and the bubbles are ejected over the space of several hours. For many years it was thought that solar flares were responsible for ejecting the masses of particles that gave rise to the auroral disturbances that are experienced on earth. Now it is understood that CMEs are the primary cause. It is now understood that CMEs disrupt the steady flow of the solar wind producing a large increase in the flow. This may result in large disturbances that might strike the Earth if they leave the Sun in the direction of the Earth. Coronal Mass Ejections, CMEs are often associated with solar flares eruptions but they can also occur on their own. Like solar flares their frequency varies according to the position in the sunspot cycle, peaking around the sunspot maximum, and falling around the minimum. At solar minimum there may be about one each week whilst at the peak two or three may be observed each day. Fortunately they do not all affect the Earth. Material is thrown out from the Sun in one general direction and only if this is on an intersecting trajectory will it affect the Earth. CMEs can give rise to ionospheric storms. These can provide a short lived enhancement to ionospheric radio propagation conditions but before long this can result in a black out to radio communications via the ionosphere. Coronal holes are another important feature of solar activity. They are regions where the corona appears dark. They were first discovered after X-ray telescopes were first launched into space and being above the Earth's atmosphere they were able to study the structure of the corona across the solar disc. Coronal holes are associated with "open" magnetic field lines and are often although not exclusively found at the Sun's poles. The high-speed solar wind is known to originate from them and this has an impact on ionospheric radio propagation conditions and hence on all HF radio communications. Solar disturbances are responsible for many of the major changes in the ionosphere. The effects of both CMEs and solar flares can cause major changes to ionospheric radio propagation, often disrupting them for hours or sometimes days. As a result a knowledge of when they are happening, and their size can help in predicting what ionospheric radio conditions may be like.